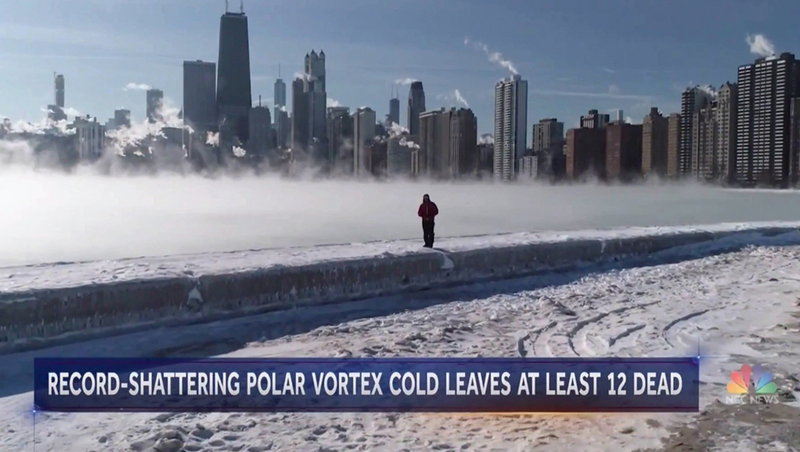 After a stunning standup Wednesday, Jan. 30, 2019, that showcased the ice covered “sea wall” along Lake Michigan, NBC News‘ Miguel Almaguer and his crew apparently felt they had to one-up themselves with even more eye catching visuals. On Thursday, Jan. 31, 2019, Almaguer was still in Chicago — and used the frozen wall again, this time climbing on top of it and walking along the top while an aerial camera, likely from a drone, captured a sweeping view of him, the city and the steam rising off the lake. His package also included standups from NBC News correspondents Vaughn Hillyard in Des Moines, Iowa, Kathy Park in New York and Garrett Haake in Washington, D.C., as well as reporter Paula Tutman of WDIV, the NBC affiliate in Detroit. To top it all off, Almaguer ended his report alongside the south side of the Chicago river with the LaSalle Street bridge in the background, before turning to face a camera stationed on the north side of the river, which zoomed out to show the massive chunks of ice floating on the surface along with Almaguer and his crew.